Romance abounds in Namibia, place of wide open spaces, endless blue horizons and long-distance travel. Welcome to the land of enormous contrasts where your sensory adventure begins on honeymoon. From the highest red sand dunes in Africa and the arid starkness of the deserts, to the turbulent Skeleton Coastline and the wild horses of the Tsumeb, this country is so romantic that you will never want to leave its deafening tranquillity. The second largest canyon in the world, this mind-boggling site is also one of the most popular and most hiked destinations in Namibia. The river only flows between February and March so book your hikes then so that you can swim. 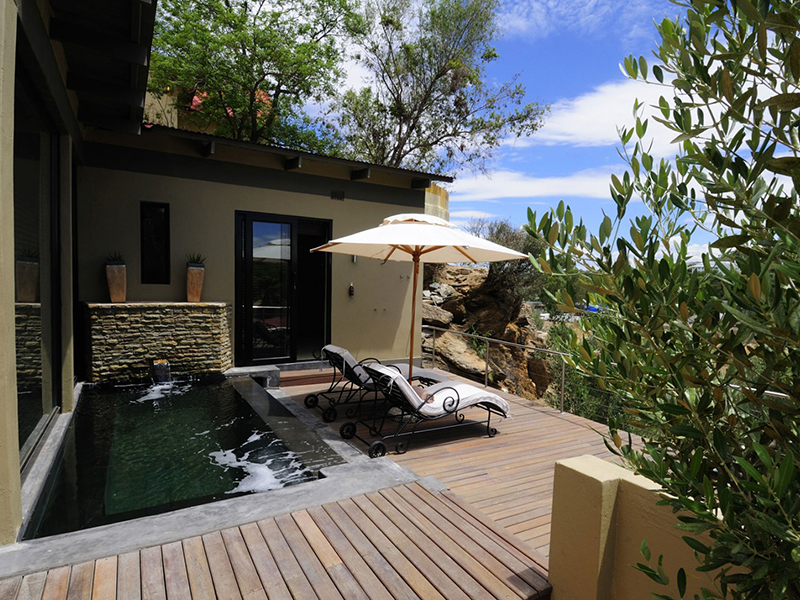 Head to this Namibian phenomenon on honeymoon and stay at Canyon Village below an outcrop of bare kopjies. Make this stark rocky setting your home for a few days while you revel in the incredible landscape around you. Toast breath-taking sunrises and sunsets together and dream at night about your future as the millions of stars come out one by one. Canyon Village is 20km from Fish River Canyon and your cottages are designed in the Cape Dutch style with spectacular views of the vast canyon. Enjoy the many murals illustrating the history and culture of the Bondelswart Nama, the earlier inhabitants of this area. This site should be on your bucket list – a famous red sand dune that towers some 100m into the sky and a very popular climb for those who want to witness magnificent sunrises and sunsets. Photographers flock to this sand dune which can be found between Sesriem and Sossusvlei in the Namib Desert. Book into the awe-inspiring Sossus Dune Lodge where you are surrounded by desert and have easy access to Dune 45 and Sossusvlei. Enjoy world class service, top of the range facilities and warm hospitality at this Namibian holiday resort. Sossus Dune Lodge is the only lodge found inside the Namib-Naukluft National Park so you have first access to the dunes at Sossusvlei before the gates open in the mornings and after they have closed in the evenings! Get there together early and feel the romance. Settle into your chalet with its orange-yellow canvas walls covering a wooden frame, thatched roof and large verandas inviting endless gazing over the dreamy landscape. Seek the Big 5 in this famous and beautiful National Park. Your trip to Namibia would be incomplete without a safari here to see the 114 mammal species and 340 bird species, usually spotted congregating around watering holes. “The place you don’t want to leave” is Onguma, a wonderful tented camp where you become attached to the perfect combination of African style chic, attentive service and scintillating wildlife encounters. Watch predators as they hunt prey and get a glimpse of the rare black-faced impala. Only 7 elegant tents feature raised wooden decks with some shade and lovely outside seating areas, sliding glass doors and large mesh windows. Fans, tea and coffee stations, animal skin rugs, walk in stone showers and large free-standing bathtubs with amazing views of the bush make this accommodation well worth choosing, especially if you are there with your loved one. Fall in love with the huge granite boulders and rocky hills rising sharply out of the arid plains in this wide-open landscape. Welcome to a spell-binding region of north-central Namibia, a rugged and surreal landscapes dotted with fascinating geological and archaeological sites. The best place to unwind in this gorgeous setting is Damaraland Camp, an eco-escape using new technology and ancient knowledge to keep their footprint on the earth very light. Appreciate fantastic nature drives and walks to see desert-adapted wildlife, ancient rock-art and striking geological formations. Romance abounds as you gaze at the crystal-clear night skies and their shimmering stars – enjoy your thatch and canvas tent with plentiful lavish comforts for a restful stay. Sit around an open campfire and outdoor boma during calm evenings. Imagine a paradise in northern Namibia that is so remote that only a light aircraft or a hardy 4×4 vehicle can get to it? This is Serra Cafema Camp in the Kaokoland region of Namibia. Travel to this chic camp on the banks of the Kunene River where 8 thatched villas feature a blend of rustic and luxury elements. Make the honeymoon suite your love nest and enjoy the best views in camp. Fall asleep to the sound of rushing water, while by day you can explore one of the driest deserts in the world. Most safaris into Namibia start and end in this capital city where you can safely stroll around wide avenues and streets taking in many architectural sights, statues and beautiful parks. Make a point of visiting Alte Feste, the oldest building there dating back to the late 1800’s, and is now the state museum. Book a few nights in the Olive Exclusive boutique hotel, an intimate haven of peace in a city that welcomes all visitors. Pick one of 7 suites, individually decorated to reflect different regions in Namibia, each boasting roomy patios and private plunge pools. Enjoy the cool, contemporary and stylish interiors, organic textures, natural furnishings and an eco-friendly approach with dedicated personal service. Romantic creature comforts make it hard to leave: an extra-length bed dressed in crisp, pure-cotton linen, and a bubble bath in a freestanding tub with sweeping mountain views. Toast the setting sun in fine style with good wines from your mini bar. These are some of the most romantic venues in Namibia and we can take you there at the click of your mouse. Ask us about our package deals for honeymoon couples and other romantic deals made for you.